Mini Kaze Ultra 40 mm fan is the power-version of the Mini Kaze 40 mm Series. A speed of 3500 rpm at an air flow of 4.9 CFM makes this fan suitable for many applications. The Mini Kaze Ultra 40 mm fan is the power-version of the Mini Kaze 40mm Series. With double thickness and accordingly bigger fan blades, the Mini Kaze Ultra boasts with higher static pressure and increased airflow while being the same height and width. With 3500 rpm and an airflow rate of 4.9CFM, a moderate noise level of 19.56 dB(A) is achieved. The Mini Kaze Ultra is suitable for various fields of application. I used this to replace a 40mm 'screamer' in a PSU. This one is indeed very quiet and pushes enough of an airflow to keep the unit cooled too. I've dropped 2 stars because of the cable on this fan. It is simply too short to do anything with, and I had to get the cable modified to make it longer, which means my warranty is not valid and it ended up costing more than it should. As supplied in the box, the cable is barely 4 inches long. The product page on QuietPC.com doesn't mention this either. Overall very quiet as described but investigate your cabling options carefully when considering this fan. Delivery from QuietPC.com flawless as usual. 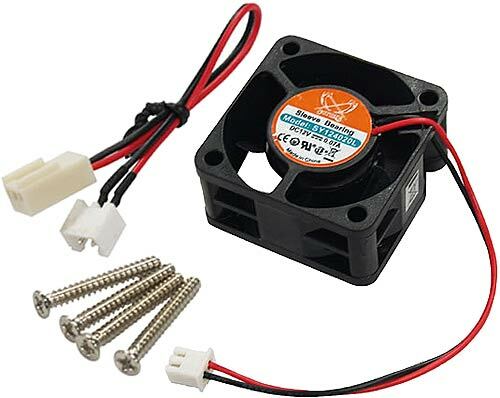 A great replacement fan for the noisy 40mm PSU fan in Microserver N36/40/54L. Only issue is the cable on the Scythe is about an inch too short - needed to splice and solder a slightly longer cable to make it fit. I purchased a Pro Powered Mixer but sadly the cooling fan was to say the least loud, though for stage use would have been fine, but in my lounge not good, then I found this site Quietpc.com and took a chance in opening up a brand new piece of equipment to see what the fan was, then I ordered two fans from here and had great service and very fast delivery, removed the old and in with the new, and what a change, now you can't hear any fan noise, a fantastic product and I thank Quiet Pc, and will recommend them to anyone, if you want a quiet life this is the place.